I spend a huge amount of time with my clients - we chit chat about their wedding, their pets, their career, favorite dinner recipes, hairstyles, dress colors. I'm sure you didn't know that I'm half stationer, half therapist, half best friend, half confident. All those "half"s explains why my pants are getting tight! All kidding aside, I do find that couples confide a lot in me when it comes to some of the more sensitive things they are dealing with. From how to word their invitations so that they include a parent that has passed away, to how to firmly let guests know that children and plus-ones are not invited. Invitation wording is tricky business, friends, and it's important for me to be a sounding party, sanity check, and MOST of all, a knowledgeable professional. Almost every bride I meet with has concerns about the guest list, and how to convey specific messages to guests. The tricky part about invitations is that it's really not proper to be straightforward, so it's a delicate dance between clarity and affordability. The traditional way to be clear about guests is to include inner envelopes, which are envelopes inside the mailing envelope that list each guest invited by name. This may be the clearest, most traditional way to handle a guest list, but the costs can quickly add up. You're not only adding one additional envelope per invitation, but you need to have the guests names printed, and you'll probably need to increase your postage to cover the additional weight. A lot of people opt to write "adults only reception" on either the invitation itself or the reception/information card. It's considered to be rude/tacky to some, while a LOT of people feel the convenience & clarity far outweigh the slight concern of offending a handful of guests. Personally, this isn't my favorite option. Aside from inner & outer envelopes, I personally always suggest that my clients use their reply cards as the communication vehicle. I wrote a whole post on how to make reply cards work for you, I find them to be the hidden gem of invitation communication. In the header image you'll see my personal favorite way to convey the number of guests invite. Yes, it requires you to be extra organized and hand-write a number on the reply cards for each guests, but it's a clear, polite way to convey the number of guests you wish to invite. Additionally, if you really want to drive the point home, you can write "number of adults attending/declining" or "list all adult guest names" on the reply card. In all honestly (this is where the therapist role comes in) it doesn't matter how many precautions you take when inviting guests. There WILL be guests that respond incorrectly, and you WILL need to have some uncomfortable conversations with people you've invited. Brace yourselves. Do you have any other tips for wording how many guests are invited to a wedding? I'd love to hear! Thank you for joining me in another Stationery 101 post! 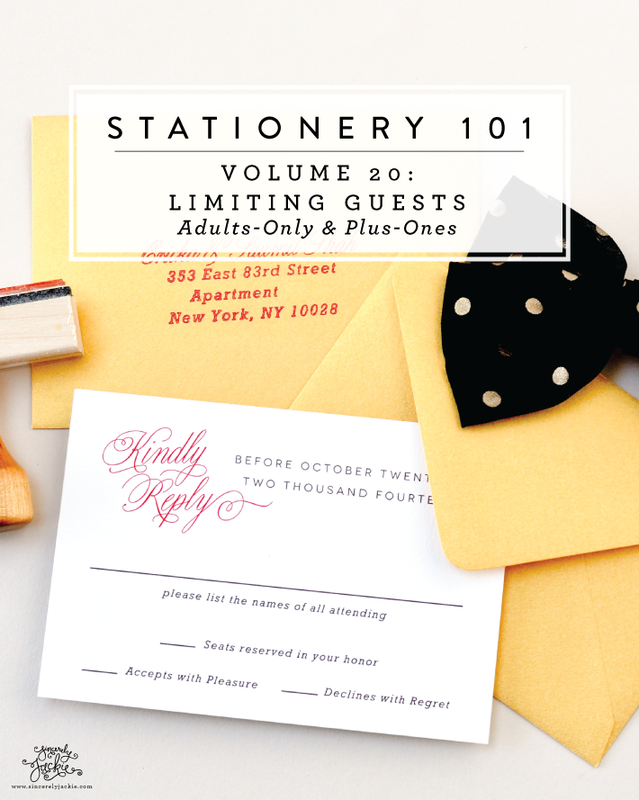 Don't forget to catch up on past Stationery 101 topics here, such as Letterpress 101, Foil Stamping 101, and Engraving 101.